Several factors come to mind while choosing professional doctors. Some of the major concerns include, are they located nearby? Will they carefully listen to me? Can I get an appointment on time? Are they charging me more or accepting my insurance? And a lot more. Referrals from family members and doctors are one of the ways of choosing a doctor but it is always great to do your own research before finalizing your doctor. Otherwise, you will make a lot of mistakes while choosing a doctor. 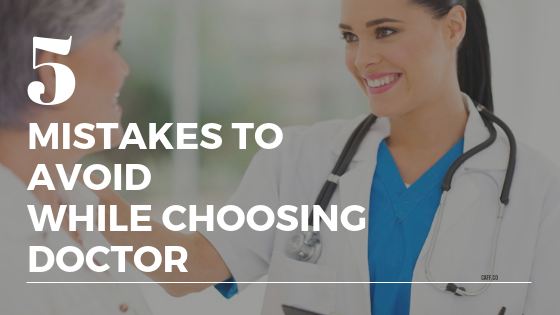 Here I am going to mention some of the common mistakes people make while selecting the doctor. This is one of the most common mistakes people commit while selecting a doctor. Don’t be in too much hurry, checking your doctor’s certification is a must step. Check if he/she is a board of doctor certified or not. Certifications indicate the expertise areas of a doctor which is very important for you to know. I am sure, no one wishes his plastic surgery be done from a general physician, for this one need a specialist in that particular area. Well, knowing your doctor’s timings is very important. Doctors’ have a tight schedule and have a very little time for every activity. Make sure to ask your doctor’s timings so that you don’t have to wait a lot for your turn. Knowing doctor’s availability and the schedule is a must. In case, if you are not able to match your timings with your doctor, have a backup plan. House hours doctors or home doctors are good options in this case. Always have a contact number of such doctors who are available 24/7 and always ready to help you. Generally, we all are looking for a doctor who is friendly with us. A friend like a doctor is not a bad idea but a coach like doctor is better. The patient-doctor relationship must be like a coach-athlete relationship. In order to get the best results, the athlete has to respect and comply with his coach. In the same way, doctors should be like a coach, whom a patient listen, respect, and obey his command. The doctors need to treat their patients like a coach in guiding them back to perfect health. Do you prefer a plumber who advise you to keep painting your water damaged wall on daily basis? Definitely not. Then why are you looking for a doctor who treats only symptoms not the underlying cause? Generally, we go to a doctor and explain disease symptoms and most of the doctors prescribe us medicines based on that only. But identifying the root cause of that symptoms is very important. A good doctor is one who identifies the root cause of the disease and prescribes medicines accordingly. If you are suffering from stomach ache, you go to a gastroenterologist. If you have a skin disorder, you see a dermatologist. These are specialized doctors. But integrative doctors have different approaches to cure the disease. Our body is all inter-related, it may be possible that the skin disorder is because of toxins present in the interstitial tissues or stress. An integrative approach not only rely on the skin but it also looks for other associated factors. Therefore, such doctors provide the complete solutions for a problem. Therefore, avoid the above-mentioned mistakes while selecting your doctor. Let me know in the comment section if you have any doubts or want to add more points.